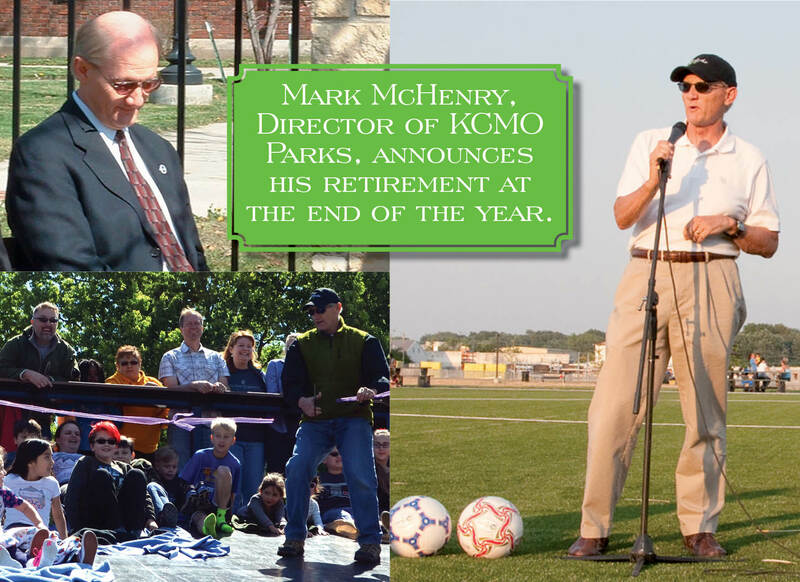 Forty-four years after it all began, Kansas City, Missouri Parks and Recreation Director Mark McHenry is calling it a career. The Parks and Recreation department announced McHenry’s retirement, which is effective at the end of 2018, in a September 12 press release. Parks and Rec Deputy Director Terry Rynard will take over as Director beginning on January 1, 2019. According to the press release, McHenry oversaw the addition of 34 parks, the construction of six community centers, the creation of the World War I Museum at Liberty Memorial, exponential growth at the Kansas City Zoo and the revitalization of Starlight Theatre during his more than four-decade tenure. In the Historic Northeast, McHenry oversaw the transfer of the Kansas City Museum into Parks and Recreation control, while also being involved with improvement projects at Kessler Park and Independence Plaza Park, the renovation of the Independence and Benton intersection, continued investments in and around Cliff Drive, and much more. Asked about the most memorable Northeast project of his tenure, McHenry deftly rattled off a voluminous series of projects in the area. He discussed the Kansas City Museum and Cliff Drive first, pointing out that turning Cliff Drive into a scenic byway made it eligible for state funding. As for the Museum, McHenry said that he still plans to fundraise for the Northeast institution in retirement. He also recalls the Paseo Gateway project, the dedication of General Obligation bond dollars in 2017, renovating the Women’s Leadership Fountain, working with Mayor Sly James and the Royals to create the Urban Youth Academy baseball facility in the 18th and Vine District, and how a couple years back, the department worked to get Kansas City’s original parks and boulevards system placed on the national historic register. Some of the areas included in the designation are parts of The Paseo, Benton Blvd, Independence Ave., Linwood Blvd., and much of Kessler Park. Looking back, there’s so much more. A particular point of pride was how Parks and Rec negotiated the deal for the old Area Transportation Authority (ATA) barn at 9th and Van Brunt. After the grounds were remediated, the area was transformed into the 9th and Van Brunt Athletic Fields. Of course, there’s no forgetting the infamous Kansas City ice storm of 2002, when a substantial portion of the city lost power for days, and trees were felled by thick layers of freezing rain turned into ice. Over the course of McHenry’s career, he’s seen three former Parks and Recreation employees move on to run their own departments at City Hall: Ernest Rouse (General Services), Gary O’Bannon (HR), and Randy Landes (Finance). McHenry also spearheaded modernization efforts such as the implementation of Citizen Satisfaction surveys and a shift into the digital era, personified by the department’s embrace of social media. The retirement announcement included details about McHenry’s early years in the department, such as repairing a fiberglass kangaroo at Penguin Park and cutting logs for the Shoal Creek Living History Museum. In retirement, McHenry will devote time to cycling even more miles on Kansas City’s boulevards and trails. McHenry also hopes to enjoy traveling, more family time and continuing his service on several parks-related boards. Over the past five years, the release stated, McHenry has embraced a mentorship role with Rynard, a life-long Kansas City resident who at age 16 worked in the summer as a weed whipper, “one of three young women who worked hard to prove that they could mow faster and carry more sod rolls than the boys.”Rynard has been a full-time employee of the KCMO Parks and Recreation department since 1987, with job titles including equipment operation, area superintendent and assistant park superintendent. Go to www.kcparks.org for more information about McHenry, Rynard or Parks and Recreation projects in your neighborhood.